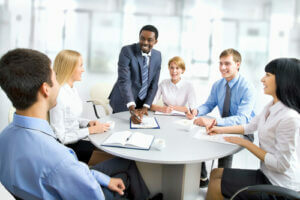 Group of businesspeople at work. Photo courtesy of Shutterstock. Five years ago, Steven Rothberg, founder of CollegeRecruiter.com, rarely heard employers talk about using analytics or data when making hiring decisions. Ian Cook, Head of Workforce Solutions at Visier, a company that develops cloud-based applications that enable HR professionals to answer workforce strategy questions, talked about the impact of analytics, specifically to campus recruiting and the hiring of recent college grads, in the College Recruiter article Analytics, data changing way employers recruit, hire college graduates. The reality is, if you are not using analytics and data, your competitor who already is using analytics to recruit and hire recent college grads and entry-level job seekers probably has already interviewed or hired that candidate that may have once been interested in your company. “If you don’t dive into analytics, then you are increasing the likelihood that your competitor will be able to scoop up all the great talent that you need,” says Cook. The move to using big data and analytics for campus recruiting, hiring recent college grads or entry-level employees has been met with resistance by both small and large employers. Many of those employers believe their campus recruiting efforts, combined with a strong social media outreach, and robust campus careers page, drives success recruiting recent college grads or entry-level job seekers. “We do hear the ‘our college recruiting program is a well-oiled machine’ from some employers,” says Rothberg. Enterprise Rent-A-Car: Dylan Schweitzer of Enterprise Rent-A-Car spoke publicly about how they use data to track their sources of hire and that allows them to reduce their spend on schools, job boards, and other sources which are more expensive than their other sources. Lockheed Martin: Alton Fox of Lockheed Martin mentioned at TalentBlend 2016 that they’re shifting more and more of their university relations budget toward job boards and other virtual sourcing tools because the cost-of-hire is far lower AND the employees are far more productive. Uber: Uber tests, tests, and tests some more with different job titles, geographic targeting, job descriptions, landing pages, and more. They work with a wide variety of media partners and many of those partners are paid on a performance basis, so if the ads they run work well then Uber keeps working with the media partner and probably increases how much they spend with that partner, says Rothberg. If the ads don’t work well, Uber shifts those resources to better performing sourcing tools. Using analytics and data to make recruiting and hiring decisions should be viewed as a way to bridge the gaps that can be cause with human oversight or human error. Analytics and data also provide a unique insight that has never been available before. So why not use analytics and data when making hiring decisions? Many organizations are focused on analyzing candidates, such as by resume parsing or extended social profile analyses, in order to improve their likelihood of landing a great hire, says Cook. Others are taking a more strategic approach and attempting to analyze the workflow and outputs of the recruiting function. Are we spending our sourcing dollars in the right place? If we change up our process, do fewer people abandon their applications? Which sources consistently produce employees who stay and perform? These are complex questions involving multiple data sources, but they are all are aligned to ensuring the function is delivering what the business needs. College Recruiter has been using analytics and data for years, providing employers with specific and organized reports to help achieve their recruiting and hiring goals. But many recruiters and HR professionals simply fear change, or the challenge of implementing analytics into the decision-making process. “The biggest reason that I see employers resisting the use of data and analytics is the fear of math,” says Rothberg. Here is an example: Rothberg recently asked the head of HR for a 5,000-employee company if they would like a detailed proposal that walked through the outcomes of the various recruitment advertising packages being considered. This proposal included projections on the number of candidates that would be sent to that company’s applicant tracking system from College Recruiter, how many would apply, how many would be hired, time-to-hire, and cost-per-hire. Don’t let analytics scare you. Employers, both large and small, are using analytics to drive talent decisions. Dive in, before your competitors steals your next great hire. Wondering how analytics can help drive your recruiting decisions and successes? Contact College Recruiter today to learn more, and be sure to Check out our blog and follow us on LinkedIn, Twitter, Facebook, and don’t forget to subscribe to our YouTube channel.